Hello, everyone. I'm new to the forums .But,not new to modding. 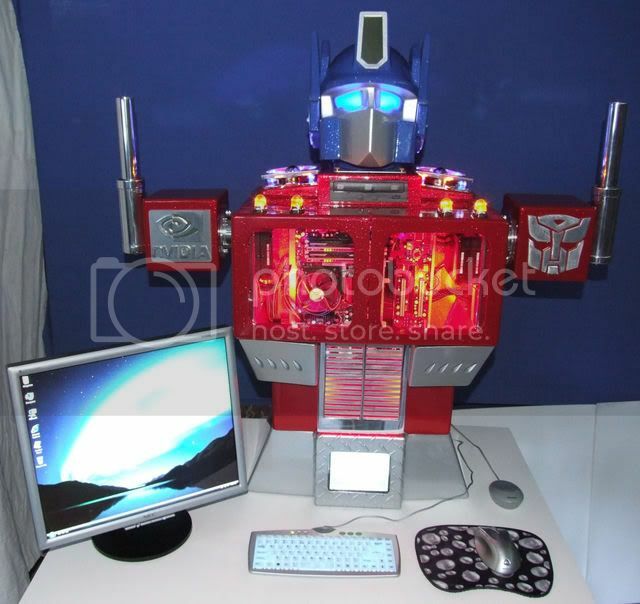 I just finished my Transformer mod. It's taken a long time to get to this point. I hope you like it. I started designing this mod back in 2004 and decided two weeks after Quakecon the time was right to build it. It's constructed out of aluminum and tig welded. Then, painted it with Freightliner blue and Peterbuilt red basecoat clearcoat then I used colbalt blue metalflake on the blue and brillant fire red on the red and applied 5 coats of clear. I wet sanded it with 2000 grit and buffed it back to shine. I was kind of waiting for someone to do a mod related to Transformers... It looks awesome!! You finally found your way here. We talked last year at Quakecon 06, you had the remote control mod last year, and you talkes to Tazz and me about the Transformer mod. We where the guys at the CPU Mag boot that had a couple of mods displyed. The mod turned out awesome and I hope that you taking it to QC'07 as I want to take lots of pictures. Do you have some sort of a build log? 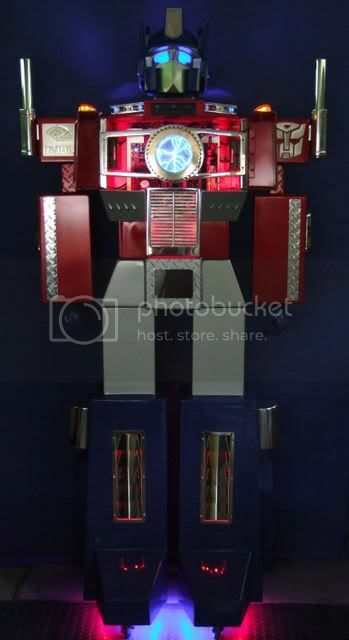 We would really like to see a few construction photos that &#34;transformed&#34; the aluminum in Optimus Prime. Looks mighty fine Maxprime and please do put it into our Gallery. Also welcome to MI, hope you enjoy your visit and come back for another. Happy Modding to ya. I want to thank you all for the kind words and yes Americanfreak I finally made it. &#34;I'm a slow mover. But, when I get rolling watch out. I'll trip myself.&#34; lol. Yes, I'm bringing this mod to Quakecon. I'll post some of the build pictures and other soon as I get to my other pc. Well, thanks again. I'm glad I finally made it here. Well, at the last moment I decided to make one last thing for this mod. After seeing how much rain texas has been getting .I am making a cover for it to slide over and protect it from the elements&#34; nothing against honda&#34; lol. It will be dark shimering blue with metalic silver sides and a red autobot logo on the front. I'll post a pic today after I get it done and this is the last thing I am going to make for it.